Unfortunately, our product configuration app doesn't work in your browser. Here's how you can still order: quickly upgrade your browser to order online or call (248) 542-9635 to order by phone. none 1/8" 1/4" 3/8" 1/2" 3/4" 1/8" 1/4" 3/8" 1/2" 5/8" 3/4" 1/8" 1/4" 3/8" 1/2" 5/8" 3/4" 1/8" 1/4" 3/8" 1/2" 5/8" 3/4"
By saving your product specs, you will also gain access to your local distributor contact information. shaft to establish flow rate. They are installed in-line in any position. Straight pipe run before or after the meter is not required. The all-mechanical sensing system directly drives the pointer, switches and transmitters. Materials of construction available include brass, 316 SS, aluminum, etc. Standard 2 wire, loop-powered 4-20 mA DC analog signal flow rate transmitter. 10 to 30 VDC, 25 mA input. "A" box is selected for price and simplicity. It holds switches (general purpose and hermetically sealed) or 4-20mA transmitter. You get this control box when you order any CONTROL BOX & READOUT starting with an "A". This control box is made of Polysulfone (standard low cost "A") with options for aluminum ("L") or 316 stainless steel ("Z"). "R" box is selected for greater resolution (more increments on the inscribed scale). It holds switches (general purpose and hazardous location all classes groups and divisions) and 4-20mA transmitter. Switch (standard service) and transmitter are offered in this control box together when signal redundancy is desired. You get this control box when you order any CONTROL BOX & READOUT starting with an "R". This control box is made from epoxy coated aluminum. "T" box is selected for availability of two isolated junction boxes with terminal strips. This means that no direct wiring to switches or transmitters is required. Digital LCD display of flow is optional ("TXL"). It holds switches (general purpose) and 4-20mA transmitter. Switch (standard service) and transmitter are offered in this control box together when signal redundancy is desired. These are wired to separate junction boxes for signal isolation. You get this control box when you order any CONTROL BOX & READOUT starting with a "T". This control box is made from epoxy coated aluminum. 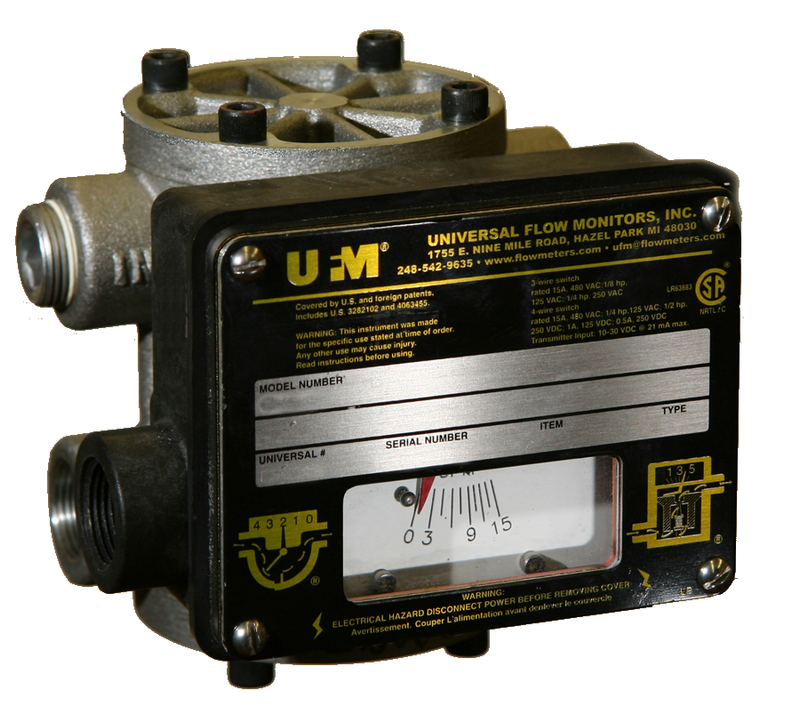 Universal Flow Monitors, Inc. was incorporated in 1963. It is a closely held company owned and operated by Erik and Lars Rosaen. This family-owned business started out making variable flow switches for the automotive industry and today services concrete, defense, chemical processing, mining, wastewater, energy, electronics, laboratories, medical, and many other industries. Universal Flow Monitors, Inc. manufactures vane style, vortex shedding, rotameters and laminar flow element flowmeters for use in industry. Applications of special interest are circulating lubrication fluid, cooling water, industrial gas, corrosives and brine.